Tuesday wraps up a jaw-dropping Round of 16 at the World Cup with Switzerland taking on Sweden in the early game, followed by England and Colombia in the final match before the quarterfinals. Oddsmakers are expecting a tight, low-scoring contest between the two European sides, and Sweden (+217) is getting the highest share of moneyline bets at 45%. They’re also getting nearly 70% of spread bets on the pick ’em line, but there’s been very little movement to report. Sportsbooks clearly haven’t been concerned about the lopsided action on Sweden. Throughout the tournament, we’ve seen public bettors flock to the over when there’s a total listed at 2 goals, but this time the majority is on the under. Early on, the juice moved from -120 to -130 on the under, but it’s now come back to the opener of -120. England are the favorites with roughly a 47% chance of winning in regulation and 63% of advancing to the quarterfinal. Just over half the moneyline tickets have come in on England (+115) to win in 90 minutes, which is expected. Bettors have also been more apt to bet the underdog straight-up during the World Cup rather than the draw, and Colombia has received 34% of bets compared to just 10% for the match to go to extra time. 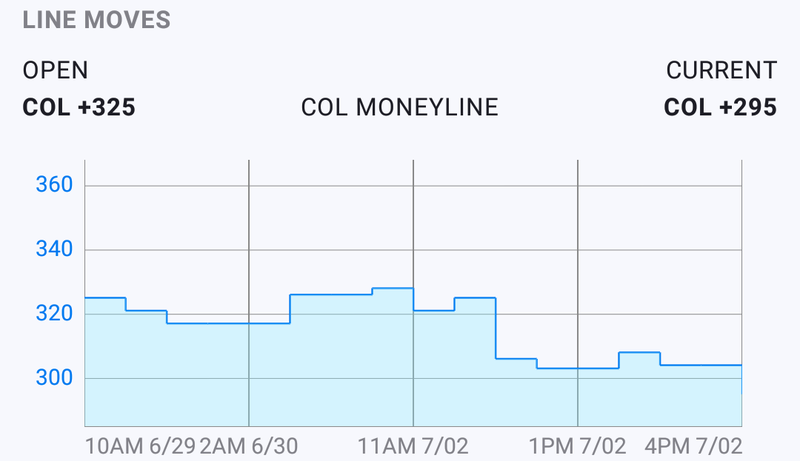 All of the early line movement has been toward Los Cafateros, who opened at +325 and are now at +295. Spread bettors are just about split on England -0.5 (+114) and Colombia +0.5 (-130). This type of wager is identical to the moneyline for England (+114), but it’s a great option if you think Colombia will either win or draw and don’t want to make multiple bets. Public bettors are not being shy about the over (2), and that’s where 80% of the tickets are going. Again there was initial movement toward the under, but juice has settled back to the opener, just like the Switzerland/Sweden total.